Attendance is declining at most types of arts and entertainment venues including sports arenas, theaters and museums. Changing demographics and online video competition are often cited as contributing to the declines in attendance. Millennials are the largest generation in human history. Americans spend, on average, 3.1 hours/day viewing mobile media. Five years ago it was 45 minutes/day. Appeal to video-centric millennials without alienating traditional visitors. (1) Add short videos to exhibits. Videos can be created by museum staff using just a smartphone with a video editing app. (2) Repurpose the videos for promoting the museum online and for viral sharing on social media. Private Sound streams sound from video displays to museum visitors' smartphones. Since most museum visitors already hold smartphones to use as cameras, listening to sound is intuitive. Visitors BYO smartphones so there are no devices to purchase, maintain or administer. Another way to increase attendance is to appeal to more ethnic groups. Private Sound can transmit multiple languages for each video. Grandparents, parents and children can watch videos together with different narration for each generation. When digital sound is transmitted by WI-FI to smartphones, the sound stream is delayed relative to the video stream. This results in "lip-sync error" when viewing the video stream. A Stanford University study found that lip-sync error annoys viewers and can cause a negative perception of the subject mattter. Private Sound is the only Wi-Fi smartphone technology with lip-synced sound. From table-top screens to video walls, all museum video screens can be updated with Private Sound. Or Private Sound can be installed with new video screens. You don't even need video screens. Private Sound will enhance all static displays. To experience the advantages of adding video with sound to your exhibits, connect a Private Sound box to a video screen. 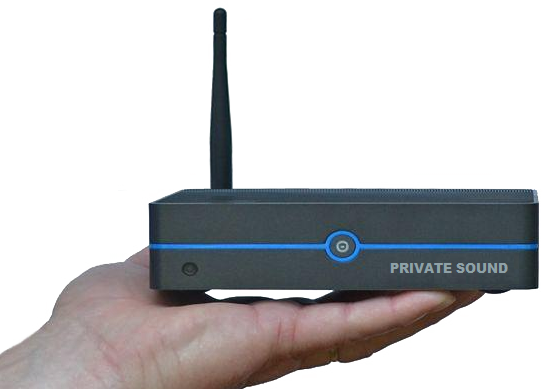 The Private Sound box will play video files – or process sound from your video player. You can show existing videos or create two minute videos using just a smartphone. The special price for the demo Private Sound box is $200. If you decide not to keep the box, you may return it for a refund. We will support museum staff for installation and video creation. 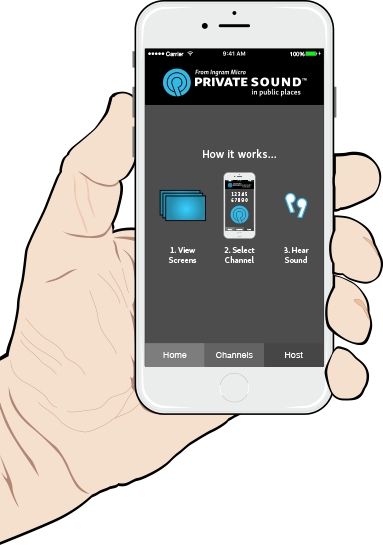 Use your Apple or Android device to download the Private Sound app. Ingram Micro is the world’s largest distributor of technology products serving more than 200,000 commercial customers in 160 countries. Ingram Micro has strategically partnered with Intel (hardware), NEC (displays) and Shaws-Lawson Technologies (software) to produce and market Private Sound to the museum and retail vertical markets.